It was a privilege to host our esteemed Patron Frank Glen and his good wife Margret for a relaxing stay at Mangawhai-by-the-Sea in Northland in mid-June. For me, living in a relatively isolated country area, any opportunity to DX with a fellow enthusiast is a bonus. With the Glen’s visit coinciding with the Winter Solstice and the shortest day of the year, it was also a chance to see how early we could hear distant low frequency stations that rely on a darkness path to propagate. There was also the opportunity to get to know Frank better as, whilst he has been a DXer for some 60 years, our paths did not crossed until recent years. And get to know this most interesting of DXers I did – of his growing up in Invercargill, taking on an electrical apprenticeship, his time as padre and priest to workers on the Manapouri Power Scheme, flying missionary work covering thousands of square miles of inland Australia, serving with Australian Forces in Asia, the return to NZ and time as a Probation Officer, Parish Minister, Lifestyle Farmer. And I discovered common interests in booking collecting, philately, military history, and much more. Frank has written 3 books about their interesting life, as well as academic treatises on church and Australian military history including a soon to be published book on Australian involvement in the NZ (Maori) Wars of the 19 th Century. As you might imagine, our conversations ranged far and wide! But when we weren’t talking, we did check the radio dial and fortunately conditions were better than average, with Latin American stations (a lot of them unidentified) on almost every medium wave frequency, and good morning and evening African and Latin signals in the tropical bands. It was good to hear Frank’s comparisons with his regular DX listening sessions at Tiwai. 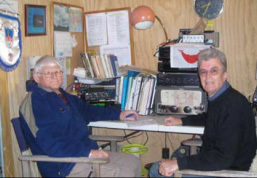 Our earliest fade in on medium wave from the Americas was Peru on 1400kHz, at 0247 UTC on the 21 st . Africans were heard on 60 metres shortwave from 0300 UTC. The pick Frank (left) & of DX for me was a mystery station on 1230 that might have been Haiti (a country which I last heard on the broadcast band back in the 1970s). 670 CUBA Radio Rebelde good & clear 0537 with popular Latin vocals 22/6 // 710 poor & 1180 fair. 770 COLOMBIA/UNID HJJX Santa Fe de Bogota on newstalk 0415, over a second Latin 770 with music format 21/6. “RCN” promo 0416. Audible past 0615. Anthem noted at 0430 (midnight in Venezuela) giving a clue to identity of second station. 1050 MEXICO/UNID XEG Monterrey one of two Latins here 0444 21/6, the other on 1050 Inca flute music. Advts for Monterrey businesses at 0447. 1200 USA WOAI San Antonio TX the most regular Yank, Coast to Coast 0448. 1230 UNID here 0333 21/6 with reggae/’voodoo’ type vocals, anncts in Creole type language. Possibly Haiti as Cuba, Antigua & Bahamas all heard at same time. 1320 PERU Radio Nacional, Lima (ex La Cronica) with SS ident 0439 & popular Latin vocals 22/6, peaking good. 1400 PERU OBX4W Lima audible daily, most heard Latin with SS sports talk & actualities from 0247 fade-in. Ident 0500 as ‘En el aire, Callao Super Radio’ 19/6. 1400 COLOMBIA Unid with Mendelssohn’s “Wedding March” and the Hallelujah Chorus heard on 2 consecutive days between 0400 and 0415. References to Colombia in possible ident at 0457 19/6. Suspect this was ‘Radio Mult-Cultural’ in Bogota. 1460 COLOMBIA Emisora Nueva Continente with gospel songs 22/6 at 0457. 1490 UNIDENTIFIED Latin with advts 0411, SS anncts over second music station 22/6. 1550 CUBA Radio Rebelde with popular Latin vocals 0409 // shortwave 5025 20/6. 1610 ANGUILLA Caribbean Beacon 22/6 with mailing addres for Pastor Scott in Los Angeles at 0410, fair & clear. 4780 DJIBOUTI Radio Djibouti opening at 0300 daily, best 20/6. Earliest Afro fade-in. 4930 BOTSWANA VOA relay poor in EE at 0308 20/6. 4965 ZAMBIA Christian Voice Lusaka fading in 0312 20/6. 5010 MADAGASCAR RTVM vgd 1859 with non-stop light vocals, some in French 21/6. Other Africans noted at this time – Zambia 4965, Sao Tome 4940, Botswana 4930, South Africa 3255 and Swaziland 3200. 6225 SOUTH AFRICA (IRELAND) RTE1 Dublin via World Radio Nerwork via Meyerton relay 2005 fair signal but good readability 21/6. Political discussion, lots of commercials, closing anncts 2029. 6295 IRELAND Reflections Europe with local prgm annct 2003 21/6, very poor. 6925 UNIDENTIFIED (HOBBY PIRATE?) pop music here 0501 followed by short echoey annct and abrupt close, poor 20/6. 7175 ERITREA VOBME Asmara with indigenous vocals 1938 21/6. Closed with anthem at 1959.